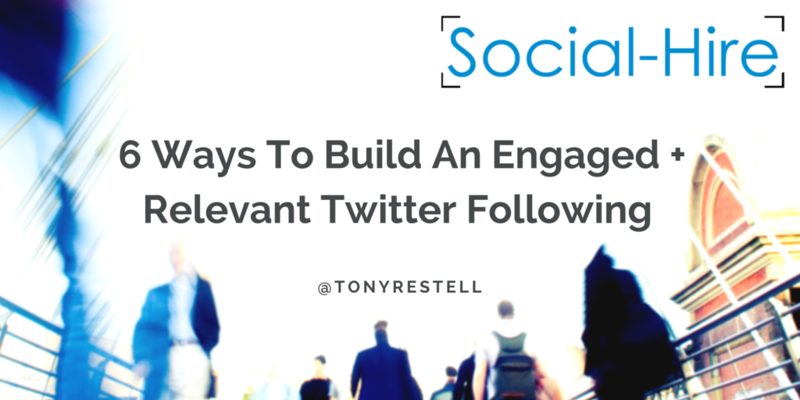 As my Twitter following (@tonyrestell) approaches the 60,000 mark and our recruiting handle (@hireonsocial) approaches 80,000, I thought I’d reflect on some lessons learnt about growing an engaged and relevant twitter following. Engagement though is essential – if people aren’t interacting with you, building a relationship and helping expand the reach of your tweets then your twitter following is just a number. Relevance is also key, time spent interacting with people who have little business relevance is unlikely to produce positive ROI for your social media efforts. Twitter is all about the moment. It’s not like email where a reply weeks after initial contact can further a relationship. Opportunities to engage present themselves for a few fleeting moments and then often they are gone. So you need to be disciplined in setting yourself some time windows each day when you will be active on Twitter and looking out for opportunities to engage (and then stick to that commitment!). Social networks can pull you in all sorts of directions if you allow them to. Twitter is certainly no different. If you don’t have a strategy to adhere to, you’ll find yourself spending a lot of time on Twitter – without any concrete outcome you can necessarily show for this at the end of each quarter. what content and updates will appeal to that target audience... and what process do I need to follow to encourage people to take the desired next step? As you use Twitter in your daily routine, you’ll find some things work really well and others flop. You'll also find that what works evolves as the size and credibility of your account grows; and that the ways people interact and follow an individual’s twitter account differ significantly from how they engage with a branded corporate account. Twitter – and the tools available to users – are also constantly evolving, so what works today will not necessarily be effective a year from now. So continually test and refine your strategy – and don’t be fearful of changing your approach in the light of the results you're seeing. That last point is key. You need to be monitoring results. Use tools to help you track the effectiveness of your tweets, and the conversions you're achieving in your twitter sales funnel. What proportion of candidates visiting your profile choose to follow you (optimise this)? How many new candidates are you attracting to your profile each month (drive this figure up)? Which approaches to engaging people so that they take the next steps you want them to take are proving most effective (A/B split test this)? For some readers this’ll mean creating lists on your twitter account so that you can turn your attention to different portions of your twitter following depending on your current priorities. For others this’ll mean creating twitter streams monitoring specific search strings relevant to you. The key is to figure out how you're going to laser-focus your attention on that tiny part of the total twitter stream that is really most valuable to you and your end goal. If you’re not active on Twitter for any given period, people aren’t going to stumble across you in their twitter streams and aren’t going to be presented with opportunities to engage with you. So it’s critical that you develop a plan to ensure your twitter stream is consistently populated with relevant and engaging content. Tools like Buffer and Hootsuite make it easy to schedule content sending in a way that can still be personable; whilst maintaining a balance of the latest information and some evergreen content ensures you always have something valuable you could be sharing with your twitter following. With our recruiting clients we find the optimal posting volumes to be 6-8 per day for recruiters targeting one geography; or a multiple of this if targeting a global audience. Clearly this takes work - and is just one of the reasons that recruiting on social media isn't "free". There are loads of tools out there to help identify which of your twitter interactions are most worthwhile following up. Twitter tools can also be used to check who you are following and to propose accounts that are of little value (ie. never engage, tweet out only new content in a 100% automated manner, are no longer active users, etc). A little time each week devoted to using these tools will allow you to focus your attentions on the most valuable twitter relationships; and to cleaning out the dead wood from your twitter following to make way for other more valuable contacts. Turning what you do into processes or schedules that you follow regularly can have a dramatic impact in terms of allowing you to get more done in less time. In terms of tools to look at, we particularly like Audiense and ManageFlitter for analysing twitter users to target; and BuzzSumo for insights about who the influencers are in our clients' niche markets. Whether you’re looking for a job, wanting to generate sales, needing to attract new hires... the temptation to push out promotional messages on twitter can be overwhelming (just think of how many recruiters you see whose twitter accounts are a stream of job postings). The same is true of trying to lure people to come and read your own content rather than sending them liberally to go and look at other people’s content. My definitive advice here is to focus your efforts on helping others and interacting with people personally whenever you can. Helping people – irrespective of the gain to yourself – will ultimately be what builds relationships and goodwill towards you. That's an essential building block to getting results on twitter (and indeed all social media), so should be your absolute focus. Personal interactions, meanwhile, are what solidify your twitter following and make people inclined to share your messages and recommend you. Try not to pass up the opportunity to personally thank people for their shares, respond to their comments, etc. Plus when retweeting, try to add your own thoughts to the tweet. It only takes seconds to do, but endears you to the person you’re retweeting far more than a simple RT. My professional life has been enriched enormously by the recruiting and jobseeker community I've immersed myself in on Twitter. But I've also seen plenty of recruiting businesses who've tried it and given up not really knowing why they've not enjoyed the same results. As I head towards the 60,000 followers mark, I genuinely hope these pointers will help you to build an engaged and relevant twitter following for yourself and to start seeing significant business results for all your efforts. If you'd like to really accelerate your results, do join me for one of our next social media for recruiters sessions, where I'll be walking through step by step how we get results on social media. They're free, so look forward to sharing insights you can put into practice with your recruiting team right away!